KATHMANDU, Nov 14: Chinese tourist arrival to Nepal has increased by 48% compared to last year, a visiting Chinese minister said here in the capital on Wednesday. Chinese Culture Minister Luo Shugang, who is on a four-day visit to Nepal, said so during his meeting with Prime Minister KP Sharma at the latter's official residence in Baluwatar, the prime minister's secretariat said. The number of Chinese tourists visiting Nepal is increasing with every passing year. Nepal has welcomed 109,557 Chinese tourists via air till September. The growth has been attributed to increasing promotional campaigns in Chinese cities, designation of Rasuwagadhi entry point as international border crossing, increasing number of Chinese restaurants and other service providers, and easy availability of Chinese speaking guides, among others. Arrivals from China are expected to increase further as Nepal is celebrating Visit Nepal Year in 2020. During the meeting, Luo also assured the prime minister of sending maximum number of tourists from his country to Nepal during the Visit 2020 Year tourism promotion campaign. On the occasion, Prime Minister Oli said that Nepal is marching ahead for achieving development and prosperity. "We are expecting generous support from our friendly nations including immediate neighbors to achieve the goal of prosperity," Oli's Foreign Relations Advisor Rajan Bhattarai quoted the prime minister as saying. 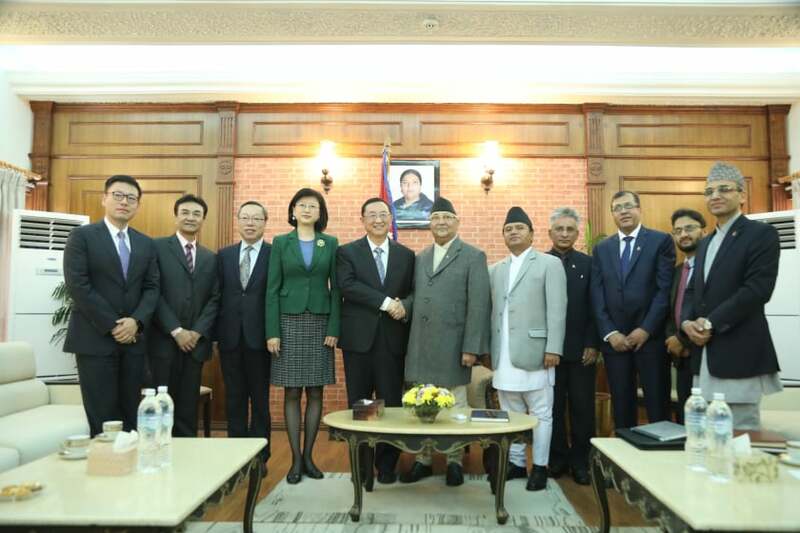 Prime Minister Oli said that Nepal and China have been enjoying age-old cordial relations. The visiting Chinese minister assured Nepal that his country would allow the Nepal Airlines Corporation (NAC) to operate commercial flights to its cities during a bilateral meeting with his Nepali counterpart Rabindra Adhikari yesterday. In the meeting, Adhikari requested the visiting dignitary for needful initiatives for allowing NAC to operate flights to Guangzhou and Shanghai among other Chinese cities. In response, Luo took the matter positively and assured to take needful steps, according to officials involved in the meeting. The Ministry of Culture, Tourism and Civil Aviation (MoCTCA) has been holding discussion with Chinese authorities regarding NAC's plan to operate commercial flights to different Chinese cities. As China is the second largest tourist generating market for Nepal, increasing air connectivity with the northern neighbor has always been a priority for the government. Nepal has intensified initiatives for the same after the national flag carrier inducted two Airbus A330-200 jets to its fleet. NAC plans to operate these wide-body aircraft to long-haul destinations including some Chinese cities. But it has still to get green signal from the Chinese authorities. As many as four Chinese airlines are already flying to Nepal, while the NAC awaits permission to fly to China. Air China connects Kathmandu with Chengdu via Lhasa, while China Southern operates scheduled flights to Kathmandu from Guangzhou. Similarly, Sichuan Airlines flies between Chengdu and Kathmandu via Lhasa and China Eastern flies to Kathmandu from Kunming. NAC used to fly to Osaka via Shanghai until 2008. It had withdrawn the flight citing shortage of aircraft. Both sides have also agreed to organize tourism promotional events in each other's countries to further increase the flow of tourists. Minister Luo attended the '8th China Festival in Nepal' at the Army Officer's Club in Kathmandu. RUPANDEHI, Sept 10: Arrival of international tourists in Nepal through Belahiya customs point has increased remarkably over the past eight months.